Zweibrücken, Germany- A new grinding system from Pallmann enables energy-efficient recycling of vulcanized rubber waste back into fine powder for direct reuse in rubber processing. 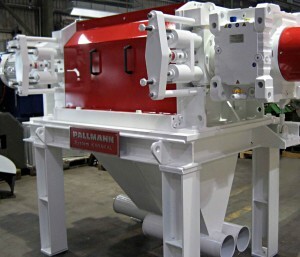 Pallmann, one of the world’s largest developers, producers and providers of innovative size reduction technology, is unveiling the new machine, called Karakal, on its stand at K2013. A key feature of the Karakal is its ability to devulcanize the rubber as it pulverizes it, so that it can be used in place of virgin material. Karakal is a type of twin-roll mill that has been designed specifically for recycling waste from production of technical parts, as well as waste arising from retreading truck tyres. It accepts material that has been pre-cut to a particle size of 4 mm or less, and which is fed to it continuously by a series of screws positioned along the gap between the rollers. Pallmann has applied for several patents on technology incorporated into the equipment. Large amounts of rubber waste from old tyres are already re-used, but mostly as a low-grade filler in building and construction. Some is also pyrolyzed into carbon black, oils, fuel gas, and other residues. In the past, cryogenics have been used for producing powder from rubber waste, but this creates particles with cubic geometries, which Gren says are not best suited for incorporation into new compounds. More recently, conventional roller mills have been used, but these create particles of around 800 to 1000 micron, which is too big for reprocessing operations. This process is also very energy-intensive. The Karakal relies on friction to reduce the size of the rubber particles. “What we are getting is size reduction by shear, not by cutting, and this produces powder with rough surfaces,” says Gren. The size of the powder particles can be accurately controlled. The machine has two main rollers with a diameter of 400 mm and a length of 1000 mm, each covered with micro-serrations. Roller speed and direction of rotation are controlled via variable-frequency drives. The distance between the rollers can be adjusted to an accuracy of 0.1 mm. The rollers are pretensioned by an assembly of springs and a hydraulic cylinder. The temperature at which the process runs is also controllable. According to Gren, at the high temperatures achievable in the Karakal process, some devulcanization occurs. “This is fantastic for the industry, because it means that processors can take the powder and add it straight back into the original mixer in place of virgin rubber.” Process air is used to cool the powder after it has been ground. The machine from a distance resembles an ordinary twin-roll mill, but close inspection reveals the micro-serrations on the surfaces of the rolls. The rolls are segmented, and the surfaces sections can be taken off, so that the serrations can be resharpened by the user. The rolls do not have to be sent back to the manufacturer for this purpose, making the machine less costly to maintain. Two additional smaller rollers located below each of the two main rollers to clean them can be fitted on request. Pallmann chose the name Karakal after the wild cat (Caracal in English, also known as the desert lynx), which, not surprisingly, has very strong teeth.